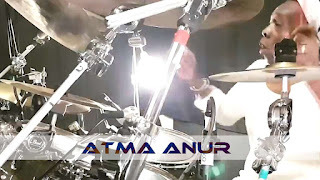 Atma Anur: Drum video of Jason Becker's composition "Altitudes" and "Perpetual Burn"
Here is Jason Becker's composition Altitudes, from his Perpetual Burn album that I played drums on back in the day. I've recently re-recorded the drums and mixed them over the original recording. It has been as much of a pleasure making this video as it was playing on the original track with my brother Jason all those years ago. Enjoy! Drum video of Jason Becker's composition "Altitudes"
Here is Jason Becker's composition "Perpetual Burn", the title track from his Perpetual Burn album that I played drums on 30 years ago this year. I re-recorded the drums and shot this video in 2016 (note the short hair), but just recently remixed the new audio and made improvements to the video quality.The song fully lives up to its title and is another example of my brother Jason's brilliant playing and writing. Enjoy!